Bergenhus fortress (Norwegian: Bergenhus festning) is a fortress located in Bergen, Norway. Located at the entrance of Bergen harbour, the castle is one of the oldest and best preserved stone fortifications in Norway. The fortress contains buildings dating as far back as the 1240s, as well as later constructions built as recently as World War II. The extent of the enclosed area of today dates from the early 19th century. 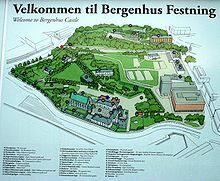 In medieval times, the area of the present-day Bergenhus Fortress was known as Holmen and contained the royal residence in Bergen, as well as a cathedral, several churches, the bishop's residence, and a Dominican monastery. Excavations have revealed foundations of buildings believed to date back to before 1100, which might have been erected by King Olav Kyrre. In the 13th century, until 1299, Bergen was the capital of Norway and Holmen was thus the main seat of Norway's rulers. It was first enclosed by stone walls in the 1240s. In the 19th century, the fortress lost its function as a defensive fortification, but it was retained by the military as an administrative base. After restoration in the 1890s, and again after destruction sustained during World War II, Bergenhus is today again used as a concert venue and as a feast hall for public events. During World War II, the German navy used several of its buildings for their headquarters, and they also constructed a large concrete bunker within the fortress walls. The buildings, including Haakon's Hall, were severely damaged during World War II but the buildings were later restored. No written records survive of the construction of the hall. According to Håkon Håkonsson's saga the building was not there at the coronation of King Håkon in 1247. It does, however, state that it was used during the wedding celebrations of King Magnus Håkonsson and the Danish princess Ingebjørg Eriksdatter on 11 September 1261. The hall is built in Gothic style. In addition to the great hall, there were two more levels, a cellar and a middle floor. The hall's similarity to English structures of the same time, and the fact that monumental stone building was relatively uncommon in Norway at the time, has led to an assumption that the hall was designed by English architects, possibly the court architect of King Henry III of England, with whom King Håkon was on friendly terms. By the 18th century, its original function had been largely forgotten. However, the 19th century saw the rise of Norwegian romantic nationalism as the country gradually regained its independence. As a result, the independent medieval kingdom was used as a source of new national symbols to rally around. In 1840, it was proven that the great stone building in Bergenhus fortress was, in fact, King Håkon Håkonsson's old feast hall. For the next half century, its restoration back to its original function was debated. Henrik Ibsen wrote a poem in the hall's honor, and poet Henrik Wergeland first used the name Haakons hall in one of his poems. The hall was finally restored in the 1890s, and in the 1910s it was decorated with frescos with motives from Håkon Håkonsson's saga, and stained glass windows. The hall was severely damaged on 20 April 1944, when the wooden roof caught fire and burnt up. The fire also destroyed all the decorations from the first restoration. A second restoration took place in the 1950s, and the hall was reopened on 11 September 1961, the 700th anniversary of its first use. It is now decorated more discreetly, primarily with tapestries. Haakon's Hall is now administered by the Bergen City Museum, which also takes care of Rosenkrantz Tower and other protected buildings in the city. The hall is occasionally used for concerts, especially choir song and chamber music, and for banquets, mainly for official functions. The keep was slightly modified circa 1520, then extensively modified and expanded in the 1560s by Scottish stonemasons and architects in the service of Erik Rosenkrantz to attain its present form. Rosenkrantz' building contained dungeons on the ground floor, residential rooms for the governor higher up, and positions for cannons on the top floor. In the 1740s, the tower was converted to a magazine for gunpowder, a function it served until the 1930s. The whole building has been open to the general public since 1966. Today, the tower serves primarily as a tourist attraction. ^ Erlend Hammer. "Bergenhus festning". Store norske leksikon. Retrieved December 1, 2016. ^ "Kristkirken på Holmen i Bergen". Kunsthistorie. Retrieved September 1, 2018. ^ "Holy Sunniva". Den Katolske Kirke. Retrieved September 1, 2018. ^ Per G. Norseng. "Håkon 4 Håkonsson". Store norske leksikon. Retrieved September 1, 2018. ^ Per G. Norseng. "Eirik Magnusson". Store norske leksikon. Retrieved September 1, 2018. ^ "Vitaliebrødrene". Bergen byleksikon. Retrieved September 1, 2018. ^ Erik Opsahl. "Erik Ottesen Rosenkrantz". Store norske leksikon. Retrieved September 1, 2018. ^ "Rosenkrantztårnet". Bymuseet i Bergen. Retrieved September 1, 2018. ^ Knut Helle. "Magnus 6 Håkonsson Lagabøte". Store norske leksikon. Retrieved September 1, 2018. Wikimedia Commons has media related to Bergenhus festning. This page was last edited on 14 March 2019, at 23:35 (UTC).